Hi I would just like to say John McConnon was 26 years old not 32 when killed in the Markham pit 1938 disaster he was my brother in laws father. My name is David Pitchford and I recently read the article in Derbyshire Life magazine asking for anyone with memories of the 1938 Markham disaster to help with the proposed artwork "Walking Together" by Stephen Broadbent. My father Richard "Dickie" Pitchford worked in the Blackshale at Markham No.1 at the time of the explosion and would be about 28 years old at the time. He lived locally at Duckmanton. He once told me about this disaster and said that he was, like many others, working 7 days a week on the face in the Blackshale at the time. He said that the district he was working on was prone to gas and as it happened there was so much gas around that it eventually made him so ill that one day he just could not go to work .... Something that was unheard of, because if you missed a shift then you would lose your place on 'the stint' for an indefinite period .... This would be the 10th of May, the day of the explosion and apparently the poor soul who took my father’s place that day was killed along with the 78 others! Obviously if my father had gone to work that day then I would not be here myself and recalling this account. Richard Pitchford survived this explosion and went on to later become a Shot Firer and then a Deputy. He also survived being buried in 3 separate roof falls and work a grand total of 50 years as a miner and I believe all of them at Markham. He eventually retired in 1974. I always remembered his check number for some reason .... It was 3044. I have always been immensely proud of his mining career and worked for British Coal myself as an Engineering Draughtsman at nearby Duckmanton Workshops for almost 25 years. I will try and make sure my two children and my three grandchildren will always remember their Great Grandad Richard "Dickie" Pitchford and how his fate on that day on 10th May 1938 unfolded. I am very pleased to hear that there is to be a memorial to all those heroes who lived and died at Markham over its history. Congratulations to all those who have conceived the idea of the "Walking Together" artwork. I am sure my father would have been equally as proud as I am. My mother (now aged 89) gave me this picture a while back - I think from the Derbyshire Times. My father William Walter Southerden (now deceased) I believe worked at Markham Colliery at this time (and for some time after the war (late 50's early 60's) latterly as a Colliery Overman. We suspect this picture shows the Markham Rescue Team, but we're not sure, and that the man, second from right back row, might be him. Can anyone accurately identify the members of this picture? We would love to know. It's a great site and it's good to know these great people are remembered. 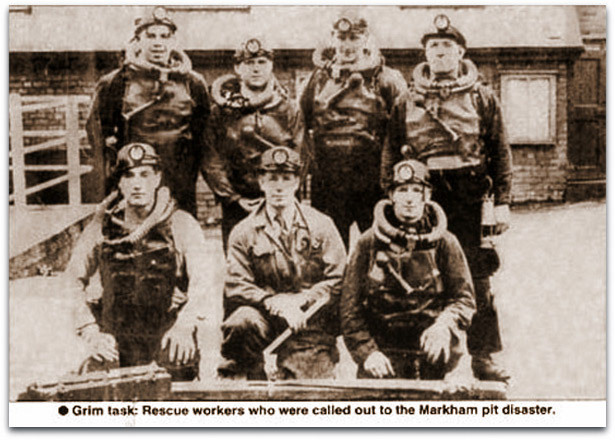 My Uncle, Sam Hartshorn was one of the rescuers who were at Markham Colliery in May 1938 and responsible for saving lives. There was a newspaper cutting from 1938 with his picture about his heroic efforts, which went on display at either the museum or the Town Hall in Chesterfield a few decades ago. He remained working in the collieries but joined up in the War, and then returned to work after that was all over. Even in his eighties, his eyes still filled with tears when he remembered all who had died. He lived from the late 1940s in Whittington with his second wife Alice who he married just after the War. She pre-deceased him, and he died in 2005. I am not sure if my Uncle Sam Hartshorn was injured and therefore he might not be the linked Sam Hartshorn. He was one of the rescuers singled out for praise for saving a life in 1938. Just a quick message to say I'm reading your site with interest. My great grandad Philip Yarnold of 39 Poolsbrook Crescent is listed which drew me. He was injured in the Markham disaster. I've read a similar list at Chesterfield Museum. My dad worked at Markham from 1971 and my husband also had a couple of years down the same mine early in his working life. I haven't had a chance to work my way through the whole site yet, I've just found it but I think it's great. You may like to know that my father, Eric Prest Dodsworth, was on the staff at Markham Blackshale Colliery in 1938. I believe he was the mine surveyor at the time. He was in the rescue team at the 1938 disaster and contributed to the rescue of the miners. He also rescued the leader of the medical team who had, I am told, strayed into a dangerous area. No where do I see his name mentioned in the reports of the rescue. I do remember that, due to the trauma, his black hair changed very soon after to silver white! He died, still with the NCB as an Area Planner, in July 1954. In August 1954 I started work in the same Blackshale pit at Markham, and was able to see the area of the explosion, whilst I was a DPT, studying for my Mine Manager's 1st Class Certificate. Because of the explosion incident and the safety measures afterwards installed, I was very aware of the tinder-box situation that would have and still existed in that particular pit.